The figures vary but in the last several years a major change has begun in organizations around the world. Sometimes the efforts are small and unsanctioned, sometimes they are big and bold, but increasingly businesses are employing social media strategically to engage deeply with both their workers and customers. We see this all the time in the large firms represented in our Social Business Council and elsewhere. One of the biggest challenges these efforts face, whether they are internal or external, is that engagement via social media is generally perceived as a voluntary activity. As in, workers can collaborate and customers can choose to interact with a business through older channels that are often more familiar and better supported by the organization itself. Or they can engage through social channels. For people to choose the social path of engagement as the most suitable one, there need to be motivations and incentives that are aligned with that path. As companies seek to ensure the highest level of success with their social business efforts, I am seeing that they want a proven, reliable way to drive adoption of their social business strategy, whether it’s an Enterprise 2.0 initiative, a social media marketing program, or Social CRM effort. But social media is not as deterministic and controllable as the channels that have come before it. It’s one of the reasons I say that its adoption is co-created. It is as much up to the those engaging to create value, sustain engagement, and build community as it is to those that sponsor them. You can’t own a community like you can buy software or a marketing campaign, social business is a two-way street like nothing quite like it. This makes adoption of social business a very different creature from the way businesses used to engage before. Early adoption This is the most nascent and delicate state, where there is perhaps only a seed of community and there is no network effect yet or core membership that can help with the essential work of social business building. The goal is to validate the direction, tools, and social business design. This is often called the pilot phase. Critical mass adoption This is transforming a successful early adoption phase into broader uptake that is self-sustaining. I’ve previously observed that this critical mass is around 20% of workers, but has been verified as even less. Mainstream adoption There is usually a long pause between the first two waves of adoption and late adoption. Early adopters are often very early and the remainder are often represented by those who have challenges in engaging in a different way, for a variety of reasons. Specific steps must be taken to address these adoption issues. Sustainable adoption A successful social businesses contains communities of people, their business activities, and supporting tools. They will largely self-organize and grow on their own once you’re well into the critical mass phase and beyond. However, these communities can also decline over time without appropriate care and nurturing. Employees move on, customers decide to leave, your company changes direction. All of these affect the long term health of your communities, and so specific adoption strategies are required for as long as you have a thriving social business environment. 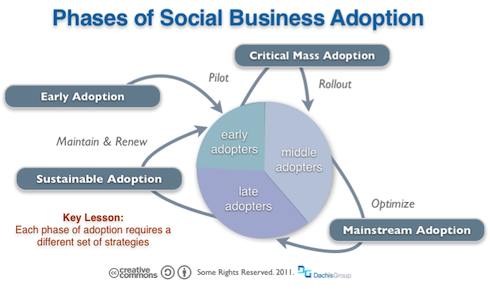 This post is part of a four part series on social business adoption that will explore each of these phases, with early adoption being examined here. For this effort, I’ve contacted over a dozen experienced social business practitioners, tapped into my research, and aggregated the results of numerous case studies. The outcome is what you see here and while it’s probably as definitive as you’ll find, it’s a necessarily limited view of a rapidly moving new field. Also, in the end, what drives adoption best is whatever actually works for your social business project, and what works best for your project often isn’t what’s in the check lists, no matter how good. Social isn’t as predictable or as deterministic as we might like, and that’s the challenge. Of course, it’s also a large part of the opportunity to drive innovative new outcomes you could never otherwise achieve or imagine. So while your mileage may vary somewhat, the adoption strategies presented here can be a very useful jump start of your social business journey. Recognizing that that although social business is part of a single continuum across workers, business partners, customers, and the marketplace, that internal use of social business and external uses involve participants that have a very different relationships with the organization. 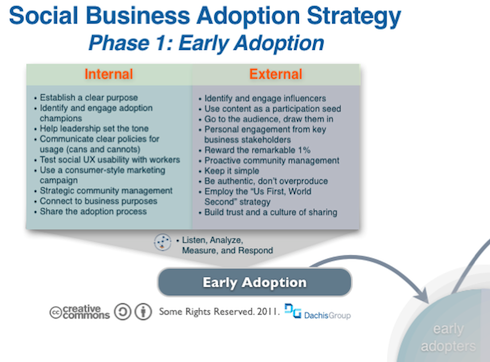 Adoption strategies therefore vary the most between these two groups and so they are presented here separately, though there is often significant cross over, particularly in areas like community management and connecting social business activities to relevant business outcomes and bottom-line benefits. Note that these adoption phases also take place during the journey of becoming a social business in the large and will be directly informed by that journey. Individual social business efforts, and their adoption strategies, should be loosely connected to what the entire organization is doing and “calibrate” to align themselves in the same direction. While the blur between internal and external communities continues to increase, for now most efforts are still separate. Listed beow are the top adoption strategies for external social business efforts. Begin with these but experiment along the way and find the adoption patterns that are unique to your environment, culture, and constraints. Establish a clear purpose. Ill-defined and vague social business efforts end up with a similar outcome. As Susan Scrupski, who formed the active and highly engaged Social Business Council (disclaimer: this is a Dachis Group online community), conveyed when I asked her what the single most helpful action she took to foster adoption was this: “We established a clear purpose for the community, combined with fostering a sense of trust and a culture of sharing.” Clearly stated intents and objectives let participants self-select, join in, and find what they are looking for while contributing more of the same. Identify and engage adoption champions. Locate and identify unofficial leaders in your target community and get them involved and participating early. They will ultimately do the bulk of the work during the early adoption phase in drawing in participation using the social networks and good reputation. Help leadership set the tone. One of the biggest triggers for adoption is when leadership clearly communicates how they’d like workers to participate in social business. While setting a personal example through participation is best, all it takes is direct, regular, and public involvement by several well-respected executives. Communicate clear policies for usage (cans and cannots.) Social media policies have come a long way from the 7 page fine print of years gone by to simple and clear directives. Specifically, the lessons learned over the years have distilled to focus on explaining exactly what employees can and can’t do in the most understandable terms. Bonus points for providing effective suggestions on when they should use social business solutions. Test social UX usability with workers. Inexplicably, usability of a social business design is too often under-tested or performed as an afterthought despite it being one of the biggest drivers of early adoption. If you don’t have budget set aside for A/B testing (which is proving to be the very effective, though more expensive) and time in the schedule to fix the biggest usability barriers you discover, you will take an adoption hit. Use a consumer-style marketing campaign. How you communicate to workers and the tone you use will set stage for the way its perceived, and in the early days perception of everything. It must be credible but it must also be memorable and convey what’s new and provide motivation to join and try it. John Woodworth of 3M Lab Collaboration used this approach successfully: “Employees already have a preferred product. By using market segmentation and a value proposition for each ‘segment,’ we identified what they would need and how they wanted it delivered. A good customer doesn’t just try your product; they buy it often and endorse it. Focus the sales on finding the ‘good customers’ and the best markets.“. Strategic community management. Especially early on, the facility of community management is one of the only real assets you have to drive social business transformation and adoption. Rachel Happe, co-founder of the The Community Roundtable and a world authority on community management, notes that “community building is a critical element of social business success and typically organizations cannot get there by deploying social technologies alone. There are a variety of contextual factors that can increase or decrease the ease of building a community but there are also some common best practices“. I’ll note these best practices in this list. Connect to business purposes. This seems obvious stated this way, but many look at social business approaches as a horizontal or general purpose communications method more akin to e-mail to IM than a way to improve a specific business activity. Sometimes this is true of course, but the best results often seem to come from those that aimed their social business design at a specific business opportunity. As Lauri Buczek, social media strategist at Intel, recently noted in Mark Fidelman’s Sure Fire Ways To Become A Social Business, “First, identify the business objectives.” Ken Domen, an enterprise collaboration lead at a large enterprise, conveyed to me that finding a “killer app” that solves a particular business problem better than before is a strong adoption technique. For example, Ken finds that IM and calendaring apps, embedded contextually in his social environment, to be particularly effective. Proactively share the adoption process. Communities are built by their members, not companies alone. Time after time, as I see particularly effective examples of social business, I see that this is a core value. The more the process is open and members are encouraged and empowered to provide structure, rules of the road, and spread the word, the more ownership, involvement, and productive work results. Experimentation should be encouraged. A leading example is SAP’s million-plus member Community Network (case study) with their SAP Mentor program. As social business scales up and goes external, successful adoption has a new, though often complementary set of requirements. Some of the differences revolve around motivation in that external participants aren’t typically paid to work for the organization like internal participants and so usually have a very different set of reasons they are involved. Other issues that tend to be unique to external social business includes appealing to a much broader demographic and competing with similar communities elsewhere on the Internet. Identify and engage influencers. Enlisting those with strong reputations and contacts related to the purpose of your social business effort has long been understood as an effective adoption pattern. Engagement with influencers takes many forms and should be connected to adoption whenever possible early on. Use content as a participation seed. At first, there’s little in a new community to draw in initial participation. Rachel Happe says this is one of her top three adoption patterns: “Create a content calendar that provides members with something they value and creates opportunities for them to interact.” Obtaining seed content can be resource-intensive and can require more investment than expected if influencers are not well-engaged early. This should be sustained until at least the critical mass phase of adoption and usually beyond. Go to the audience, draw them in. Build a community on a far corner of the Internet makes it hard for new participants to find it. This is one of the reasons that Facebook pages have become so popular, by going directly to where a vast, already social and participative audience is. There are many approaches to this but it can greatly aid adoption when integrated properly. Reward the remarkable 1%. By now just about everyone is familiar with the 90-9-1 rule, where 90% are passive browsers, 9% contribute a little, and 1% account for a disproportionate amount of the value created. These are rough numbers for external social business participation. While the specific technographics continues to fluctuate a little as the market evolves, the key to driving adoption is ensuring that your most valuable contributors are incentivized appropriately to contribute, once you identify who they are. While timing and perceptions of conflict of interest can be issues, rewards typically run the gamut from simple recognition to more formal business relationships. Be authentic, don’t overproduce. Over the years, as I’ve collected best practices for online communities, I’ve noticed a common pattern. The fanciest and slickest social business experiences don’t necessarily achieve nearly the uptake as ones that are simple, basic, and straightforward. Though social media marketing aspects of social business can be an exception, excessive polish conveys a sense that too much lipstick is being put on. As John Hagel has talked about a trust paradox and social business, that being truly genuine and letting human realities be exposed is much more likely to sustain adoption and less likely to actively repel participants. Employ the “Us First, World Second” strategy. Time and again, when I’ve spoken to social business efforts, they explained how in the early days everyone was on deck in the organization and helped create the seed of participation. I’ve even heard it phrased that at first “it was 90% us and 10% them, and then later it was 90% them and 10% us.” Driving early adoption in this was is successful but unsustainable at a high level for long and must be timed right. “All hands on deck” may be problematic for your organization for various reasons but it’s a powerful tool for early adoption when it can be used. Build trust and a culture of sharing. This is one of Susan Scrupski’s adoption lessons and has been repeated by just about everyone I’ve spoke with over the years. It’s not just enough to build trust, the culture must be one where the free exchange of ideas is valued and encouraged, because that’s the observable value that drives innovation, better decisions, and more. Building that culture requires leading by example and rewarding contributors both. Note that this list cannot be exhaustive and there are literally dozens of techniques large and small that one can attempt to drive adoption of social business. You should also never forget the fundamental cycle of listen, analyze, measure, and respond. However, these cover the more widely used and repeatable techniques that I’ve seen of the many social business efforts that I’ve examined over the years. I’ll be covered the remaining adoption phases in upcoming posts but welcome your feedback to improve and extend this list.